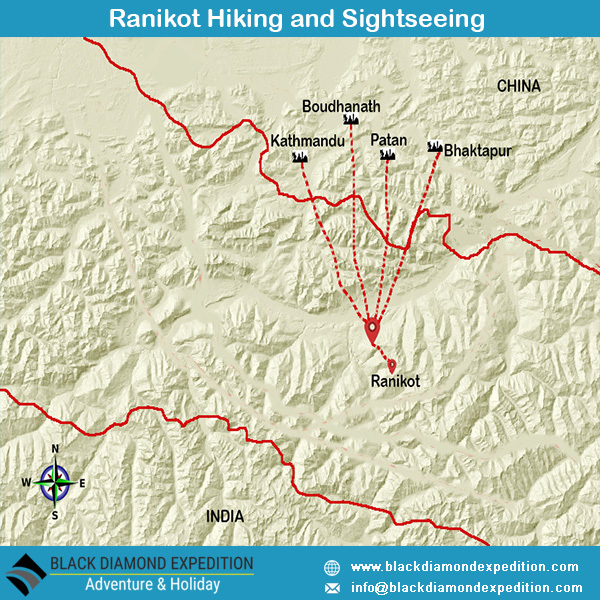 Ranikot Hiking and Sightseeing trip is especially designed for the beginning hikers. Ranikot hike commences from Suryabinayak Temple of Bhaktapur district and can be covered within four to five hours of leisurely hike. This trail offers great panoramic view of Himalayas and bird eyes view of the entire Kathmandu Valley as well as the historic sites and renowned temples. In a very short distance one can get a chance to see and differentiate the lifestyle of urban city and rural village. You will definitely relish the pleasant and calm environment of Ranikot. Early morning after breakfast drive towards Suryabinayak. Start the hike taking bless from Suryabinayak- a god having elephant head that is worshipped first in Hindu religion in any religious work. Along the way you will passes through beautiful landscape view, greeted by lush greenery and how much you go up and up the view is more and more spectacular. On the way, visit Pilot Baba Ashram. After an hour pleasant hike reach in Ghampe Danda and take a tea break. After another one hour hike you will reach in Ranikot. Take lunch and rest in Panorama View Tower Resort. You will see the airplanes flying below your height. The bird eyes view of Kathmandu Valley, eye level hills and northern high Himalayas are just marvelous. After lunch we hike back to Kathmandu visiting Bhairav temple, the Ranikot Fort (only vanish remain) built by King Prithvinarayan Shah in the medieval period (Malla Dynesty). Ranikot is a hill point to see the three cities of Kathmandu valley i.e. Kathmandu, Patan and Bhaktapur at once. Dinner and overnight in Kathmandu.